#Whatsthestory? 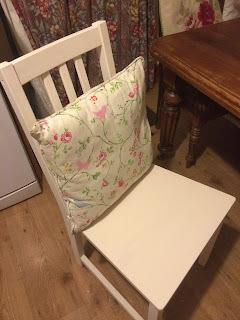 Shabby Chic "Vintage" Ikea Chairs! I am known for my love of the "shabby chic" look. If it's painted white, grey or green badly and has splinters to boot I'm going to covet it. This started years before the current craze when a South African friend of mine lived in a tiny cottage in the woods which lent itself beautifully to the 1950's look. She had gingham curtains instead of kitchen cupboard doors and little interesting nick-nacks everywhere. You can of course buy the "look" in your local High Street now but I still prefer to make my own fancy tat, especially since it turns out I'm really good at painting things badly! My project this week involved tarting up our grubby "emergency" Ikea chairs so they looked good enough to have permanently round our table (one of my best Freecycle acquisitions) along with some old chairs we found in the depths of our attic. I gather the proper way to approach these painting projects is to buy special chalk paint but as I have said so many times, we are permanently broke. So armed with some Fired Earth "Light Umber" passed onto me by a friend who didn't need the rest of the tin and some cheap paint brushes I slapped on two coats in the course of an afternoon. As those who know and love me know, I am incapable of passing bare woodwork when I have a paintbrush in my hand so I also painted a nasty orange pine bedside table and a mirror which now form my hairstyling and makeup station at the top of the stairs! 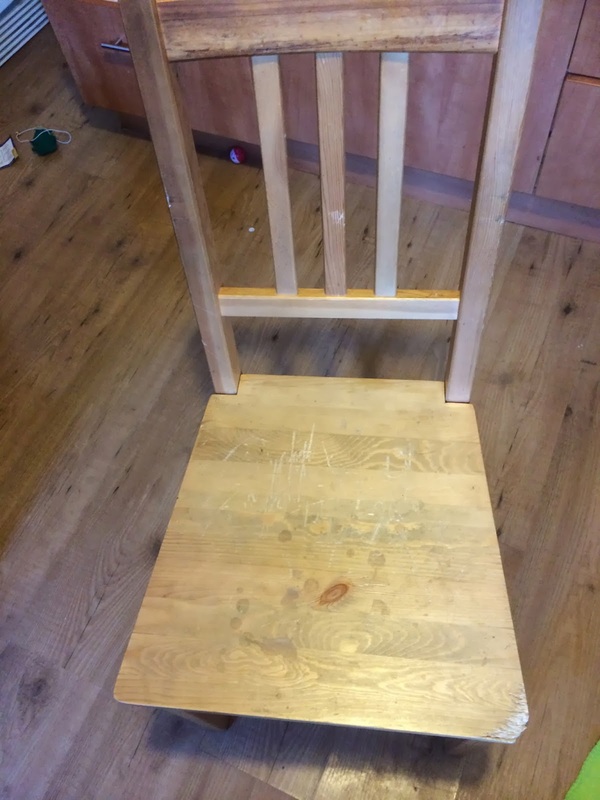 You can use a wire brush or sandpaper to further "shabby" your paintwork when it's dry but frankly with 7 children it won't be long before they look genuinely old and tatty without me resorting to rubbing off corners! The chairs were dry by evening although we did have to spend much of the afternoon shooing off curious cats who seemed determined to get "light Umber" highlights in their coats. We held our breath and interspersed them with the dark wood chairs and added mismatched cushions hoping it would look sweetly eccentric and not just plain barmy - I am pleased with the results so that's what counts! Love the look. I too like Shabby Chic and been wanting to do little projects too, but haven't really gotten around to doing any! :)) #WhatsThe Story. 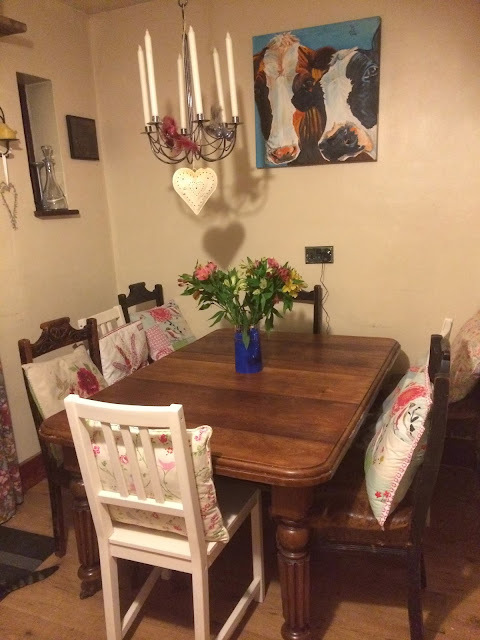 I think your Shabby Chic white chairs look great around your table - well done.